Introduction to 4x4 Off-road driving is our core course for private and commercial drivers who do four by four driving regularly or drive off-road. This course is available daily for individuals or groups from our centre near Andover. It can also be provided by arrangement at other locations across the country. Just contact us to let us know your preferred dates. The one day course costs only £350 and discounts are available for group bookings. Off-Road Driver Training: Moderate ascents and descents, ditches, ridges, ruts and side slopes. The Introduction to 4x4 Off-road driving is highly practical, working with individuals or small groups, to learn about the 4x4 they own and drive, to understand how to best use the controls and how modern technology works. 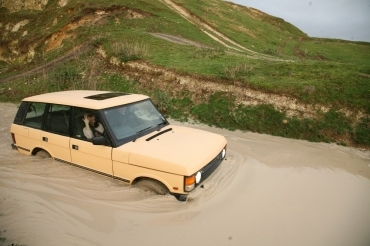 Our introduction to 4x4 off-road driving skills will give you confidence to use your vehicle in adverse weather conditions such as snow and flooding, how not to get stuck when venturing onto slippery surfaces, muddy fields or lanes. We will ensure that you are competent in core skills of four by four driving such as vehicle safety checks and understanding the range of controls available on your vehicle. You will then put this into practice gaining skills and confidence to tackle moderate ascents and descents, ditches, ridges, ruts and side slopes. By the end of the day your confidence will have grown as we teach you to safely negotiate more challenging ground. This course is very suitable for anyone who has never driven off road before or for the more experienced driver that has bought a newer model with computer technology or just wants to extend their experience level under the expert guidance of one of our trainers. The introduction to 4x4 off-road driving uses ratios which guarantee safety at all times and ensures all candidates get maximum coaching and feedback. The course can be delivered in your suitable 4x4 vehicle, or in our range of vehicles. (Vehicle hire fee of £60 to use our vehicle). It was great to get such a practical course - I feel I've gained a lot of confidence and new techniques.